Taste test: The all-in-one package combines round tortilla chips with a cheese dip. The chips are really bad, and really stale, too. Cheese sauce: Standard taste. Another opinion: The sauce has some kick, with a hint of jalapeno. Smell test: Standard nacho cheese dip smell. The chips smell like paint. 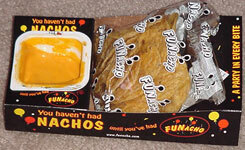 Trivia: "You haven't had nachos until you've had FUNachos. 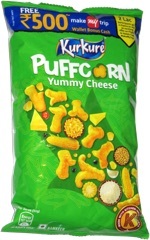 A party in every bite"